I started writing this post on my phone while on an airplane. (LAX to Pittsburgh) I also started to draw my charts while on that same shaky long flight. Lets just say these charts look like a 4th Grade Science Fair project but not the kid who wins, those charts always looked good. So in the spirit of the 4th Grade I will write this post like Science Fair project. Enjoy. And if you aren’t sure what the Sennheiser G2/G3 EW100/EW300/EW500 SMA mod is check out this post. The Sennheiser G3 SMA Mod will increase usable range and give better stability of the signal overall. I drove an hour outside of LA to the La Verne California. There we found a empty baseball field and setup in left field (or was it right field… is it like stage left where its all about the peopling performing for the audience… IDK) and we had the transmitter placed in our subjects pocket. We used a Sanken Cos-11D with the extra cable wrapped around the transmitter. Audio input levels were set so that the peaks are just bumping up against the Sennheiser’s limits for the best signal to noise ratio. The subject walked from Left/Right Field across the outfield and into a neighboring ball field. No metal fences came between the TX and either RX used in the test. See the diagrapm below. The understanding of what is “Usable RF” and what “Some RF Hits” was based on if the editor of a cheap MTV docu-follow would have to use subtitles in order for the audience to understand what the dialog was suppose to be. “Some RF Hits” is acceptable on these shows. For what qualified as “Usable RF” was based on the standard a post audio supervisor would use on if the audio was audible enough for a feature film. Here is a poorly drawn chart of the results. The results are shocking and very interesting. Some things to note is the stock antenna’s RF signal to distance felt very much like a linear scale. For every foot you away from the receiver, the RF signal diminished equally. The other 3 all had far less overall declines in RF signal but eventually all of them felt like they a hit a cliff that resulted in a steep drop off in RF. The distances between the 3 also was remarkably similar despite the RCA UHF Dipole being a 1/2 wave and the Log Periodic adding the most dB gain. The Log Periodic did reject the most outside RF interference. Second was the Remote Audio Stiff SMA Antenna, and the Dipole and stock really tieing when it came to rejecting outside interference. This shouldn’t really be any surprise, the LP and the Stiff Antenna are positioned to recieve RF waves on the vertical, TV UHF signals are broadcasted on the horizontal. The stock antenna is bent limp anf the RCA UHF Dipole is very floppy because its a thin strip of metal in a Dipole antenna pattern printed on flexible plastic. An antenna that is stiff and on the vertical pickup instead of on the horizontal gives you a 6dB in separation between your transmitter and surrounding UHF TV signals in the same spectrum. The other thing we noticed was the lack of RF Hiss in the signal within zero feet to max usable range. So often the G3 is said to have terrible sound quality. That is no longer the case. The audio was more than usable in for most productions. So what’s the science at play and why do 3 of the antennas have similar results. 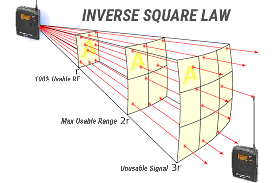 Simple, the Inverse Square Law. The further the receiver is from the transmitter the less “RF waves” each square gets. Each square in this chart can be thought of as an antenna. The further you get back the signal gets cut in half, and in half, and in half again. Here is a chart that shows the diminishing return of a 30mw transmitter. Now different antennas do help recieve these smaller fractions of a signal and add dB gain so receivers can read that signal BUT there is a limit. Here is a simple way to understand that. So at around 150-200ft we noticed the G3 RF Signal < UHF_Interference depending on which antenna we used. And just beyond this range we noticed a dramatic spike in RF static and RF Hiss. This can be thought of as the fraction of the 30mw was too close to zero even with dB gain added and no longer greater than atmospheric RF. Adding gain does not help pickup fractions of a signal, it just moves the signal further down longer cables while trying to overcome the cable's natural resistance. 75 Ohm cables offer too much resistance and will kill your signal. 50 Ohms hurts your signal less and doesn't need a boost over short runs. So, no matter what antenna you use after the mod, it can be said that 30mw can only go so far according to physics and that's what we've proven today. I think personally the cost/size/results of the Remote Audio SMA Stiff Antenna really show that its the best choice. Plus with a simple right angle adapter can still be used when you tip your bag on its side when you place it on a cart. This also means you can set the squelch on your G3 to low and really enjoy your new found range. How did you place another antena in a G3 receiver? Thinking of doing this mod to most of my current out of warranty G3’s/G2’s and wondering what you think of replacing the Tx’s antenna as well? Obviously it will not send out more power but do you think it might create a more stable signal? Also eliminating the issue of damaged antennas over time by being able to replace them with the SMa antennas? If you are operating inaide the USA, which I am, you are bound by the rules of FCC part 74. It says operating a transmitter with a removable antenna that uses a standardized connector requires you to have your FCC license. I can no recommend you modding your transmitter if you are not licensed. If you are, maybe do the mod??? The cost vs reward would say it is not worth it. The reciever mod seems to increaae stability and range enough for most general purposes. Beyond those ranges it really is wiser to look at using Lectrosonics. Yes exactly, I use the wide band receiver LM/A1 Lectrosonics for my first two inputs. In general looking of updating to an SRc for my 633. That way I’m working with 4 Lectro Ins and a possible Senn 5 / Boom setup via the different modes. But you know how tough the market has been, so making logical steps to improve working technology is always helpful. – I appreciate your efforts and sharing the mod. This sounds awesome! I own a G3 in the 823-865Mhz range. Is there any good antenna I can buy for this range in Germany? You could still cut it shorter, right?